As the name clearly indicates, The Luxe Condominiums in Lower Queen Anne are anything but ordinary. The luxury condominium building, was constructed in 1967 and converted from apartments recently. During the conversion, the building was thoroughly remodeled, both inside and out. New systems, exterior siding, and a variety of unit updates such as custom countertops, African Tay and Koto wood cabinetry, and stainless steel appliances are just of few of the exquisite features of the condos. If you’d like to experience these luxuries, but simply can’t buy, you are in luck. Agent Bryan Graf has recently listed a condominium in the building for rent, offered at $2,300. The Queen Anne condo is an incredible, two bedroom, two bathroom unit with over 1,200 sf of comfortable living space. The living room is light, bright and gracious in scale and features multiple sets of large windows. An expansive master suite with a partial bathroom, ample walk-in closet and separate den is the perfect retreat. Perhaps one of the most exciting features of the condominium is the 520 sf wraparound deck, ideal for summer barbecues and entertaining. Other features include hardwood floors, energy efficient flat panel radiant, air conditioning and a full size washer and dryer. The condominium comes with one allocated garage parking spot. The Luxe is situated on the hill mere blocks away from the best cafes, restaurants, nightlife, and shopping that Queen Anne has to offer. 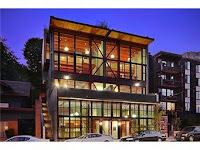 It is also minutes from downtown attractions including the Seattle Center. Don’t miss out on this great opportunity to rent in an ideal location, and in an amazing building. Please contact Bryan Graf for more information. Thursday was the neighborhood meeting to discuss the Alaskan Way Viaduct. The state has begun the preliminary stages for replacing the south portion of the Viaduct. You probably have noticed the cleared lot with construction equipment near the Seneca exit off of Highway 99. The south portion of the viaduct is the first to be replaced with a new overpass and additional street to help avoid lengthy backup due to the railway. See my previous blog for more information. The Viaduct is scheduled to come down in 2015. The proposed tunnel is still awaiting its environmental review, which should be done Oct 28th. The board will need to review the environmental statement for over a year, and an expected decision should be made mid-2011. Pioneer Square and the International District should have no immediate threat. Next year will be the start of construction on parts of the viaduct near the Pioneer Square District. This will force heavy traffic onto 1st Avenue and Alaskan Way waterfront. The SDOT has already completed most of the preliminary work, which should help support the added pressure to some areas. Please visit www.alaskanwayviaduct.org for more information. Most of us Belltowners are familiar with the P-Patch, located in the heart of Belltown sitting at Vine and Elliot. We’ve noticed the greenery and the three...buildings? These buildings are “huts”, more specifically, homes, that have been standing (although recently renovated in 2004) in that same location for over 90 years. They are the last 3 of 11 that were built as single-family residences in 1916 and owned by William Hainsworth to serve as homes that would eliminate the commute to the downtown Seattle industry core. The “Belltown Cottages” were determined Seattle Historic Landmarks in 2000, and in 2003, some of us (who know about it) began referring to them as “Hugo Huts”. The name “Hugo Huts” comes from the P-Patch’s attachment to the non-profit group Richard Hugo House, based in Capitol Hill. The Richard Hugo House is a center to promote the arts (specifically literature) that aims to promote new writing and provide writers with the resources they need to share their work. The Hugo House has been leasing two of the huts to house their writers on a month-to-month basis and in rotation. Unfortunately, this long-standing relationship has ended. The Seattle Times released an article stating that the Hugo House will no longer be using the homes as writer residences as of September 1, 2010. The Hugo House was initially invited by the City of Seattle to participate in the program to “strengthen the artistic diversity of Belltown”. Now, because of liabilities and security reasons, the cottages will no longer be leased to the participating writers of Hugo House. ‘Friends of the p-patch’ will continue to support this little piece of history though, despite the fact the two homes will be vacant-at least for now. For more information on the Belltown P-Patch, please visit their website. 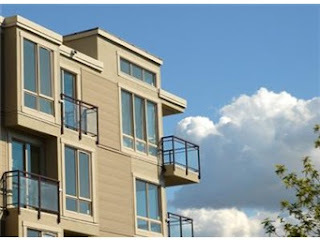 The trendy and modern “The Block” condominium project located at 1707 Dexter Ave in Lower Queen Anne is a 6-unit mixed-use building constructed of concrete and steel. The building has an exterior of braced frame and metal siding and offers spectacular Lake Union views, as well as those of the Cityscape and Capitol Hill. 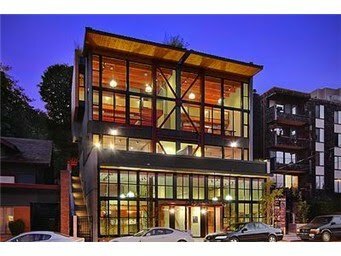 This unique Queen Anne condo is the only one in the building available for rent and is listed by Ewing and Clark real estate agent Nate Pearson, who has leased the condo once before. The condo offered at $3,650/mo features interiors just as stunning as the exterior. The interior contains a double height living space, exposed steel columns and wood beams, as well as high-end stainless steel appliances, bamboo floors and floor to ceiling windows. The unit is 2,400 sf with 3 bedrooms and 3.5 bathrooms. There is also an attached 2-car garage which is a nice feature for any condominium unit. Do not miss out on this amazing opportunity! Please contact real estate agent Nate Pearson for more information.